The Preble County Educational Center (ESC) Alternative School has a new Animal Assisted Therapy Program. In it, counselor Brent Krumdiack is shadowed by his dog Oakley on Mondays and Fridays to meet with students and staff alike. The program began in January. EATON — The Preble County Educational Center (ESC) Alternative School has a new Animal Assisted Therapy Program. In it, counselor Brent Krumdiack is shadowed by his dog Oakley on Mondays and Fridays to meet with students and staff alike. Since the program began in January, Krumdiack has observed a huge difference in the students he sees. Planning for the program began when Krumdiack was hired as counselor and he mentioned being interested in Animal Assisted Therapy. Principal Brent Short and Assistant Superintendent Shawn Hoff were intrigued, as they had a previous employee consider a similar program. Krumdiack began his research, planning on using Oakley due to his natural comforting ability and deep empathy. Krumdiack, his wife, and Oakley all underwent Animal Assisted Therapy training at DOGTORS University. Once they graduated (with an awards for Most Improved Dog) it was time to present the potential program to the ESC Board of Education. With its support, it was time to find liability insurance to cover the program. Through DOGTORS University, the ESC has liability insurance for volunteers, but since Krumdiack will be working with Oakley, the DOGTORS University liability insurance does not cover Oakley. The liability insurance Krumdiack carries as a school counselor covers him, but not Oakley. The problem was finding an insurance program that would cover Oakley while working at the Alternative School. After continuing his research, Krumdiack found a company that would cover Krumdiack and Oakley completely. The program was brought to the board for approval and members were in support of the program. The Animal Assisted Therapy Program began at the Preble County Alternative School in January of 2019. Oakley only comes into the school on Mondays and Fridays, as a more frequent schedule tends to exhaust him. Krumdiack’s room is his safe space and home base, but he also visits different classrooms and areas in the school. As students come in to talk to their school counselor, they have the option to pet and interact with Oakley, making them feel more at ease and comforted. He also visits the classrooms to help calm the students down. “I have three students right now, specifically, that didn’t give me the time of day before he started. Now they’ll talk to me regularly, even if he’s not here. Oakley is definitely a big ice breaker and helps get some of the kids who wouldn’t normally come in. He has also helped me with some classroom guidance, he was with me next week when I started the Why Try program here,” Krumdiack said. “That has been a big thing, Oakley helping me make connections with students. The students are also more calm around him, because they don’t want to scare him. He definitely has a calming influence wherever he goes. 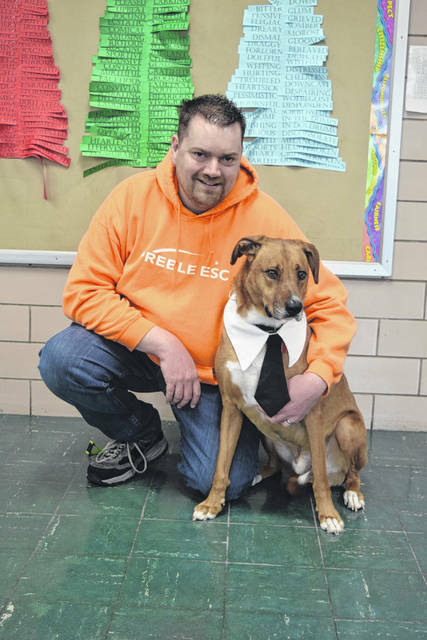 https://www.registerherald.com/wp-content/uploads/sites/41/2019/03/web1_Oakley.jpgThe Preble County Educational Center (ESC) Alternative School has a new Animal Assisted Therapy Program. In it, counselor Brent Krumdiack is shadowed by his dog Oakley on Mondays and Fridays to meet with students and staff alike. The program began in January.